Screw the five rubber cones into their respective holes on the ring. Keep adjusting the rubber cones until the ring fits your arm. Rotate the ring around your arm or do forward-backwards movements. Use massaging oil if need be. You should clean the rubber cones with mild soap-water. Remember to start treatment carefully and by listening to your own body. Keep adjusting the rubber cones if you feel like you need more grip. 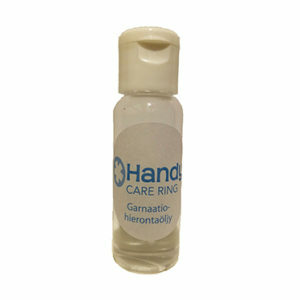 Using the ring regularly provides the best results in terms of lessening and preventing pain. NOTE. 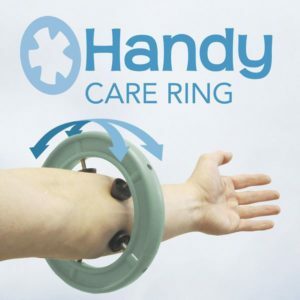 Avoid the use of the Handy Care Ring™ if there are signs of acute infection on the muscle (effusion, swelling) or if you have cuts on your skin. People who are allergic to rubber should also use care and attention.